A liquor similar to mezcal, typical to Sonora. It is produced from the distillation of a variety of maguey named Agave angustifolia, and is gennerally cured with almonds, walnuts or pine nuts. Can be legally produced since 1992. Plowing. To prune or cut of points from the leafs or pencas of the agave. 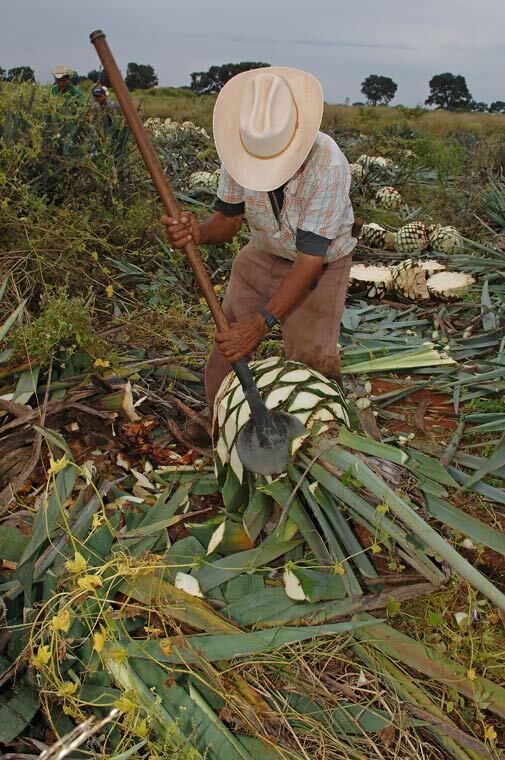 It is believed that plowing is a type of pruning that makes the heads or stem of the maguey grow. Shotgun ploughing. Pruning to induce premature growth and ripening of the plant. A wooden container used to transport liquids.This is an old unit of measure equivalent to 833 kg. 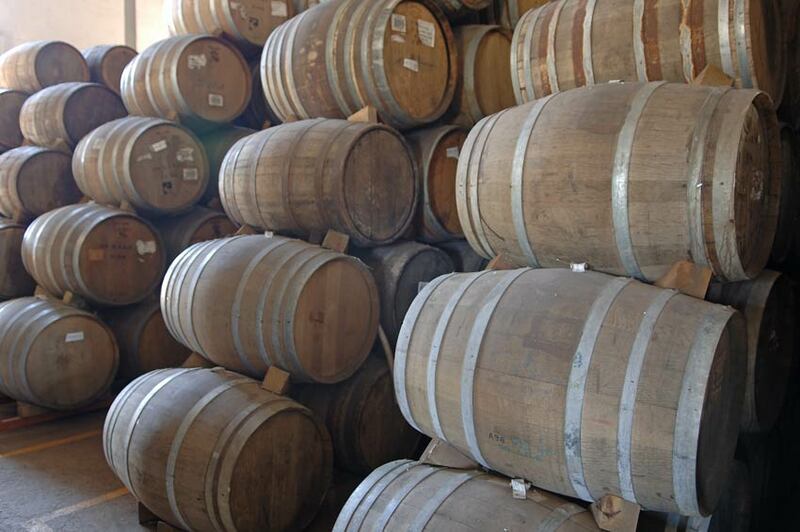 Barrel or cask, usually oak used to age tequila. Tequila is aged in white oak barrels. Normally a barrel has a 200 liter capacity (approx. 60 gallons). Barrels are often purchased from cognac or bourbon producers. Sometimes other woods are used. Smaller sized barricas are availalbe for home use in 1, 2, 3, 5, 10, and 20 liter sizes. Photo on right shows 200 liter barrels. More tequila barrel pictures. Beater. A naked worker, the beater, gets into the wooden tubs with the must (mosto) during the traditional process of making tequila. He uses his hands and feet to beat and soften the fibers from the mashed piñas to aid fermentation. Clear, unaged tequila that is normally bottled right after being distilled. When the clear white tequila drips from the cooling coils of the alambique, it is correctly called silver or plata, but is more commonly called white or blanco. All Tequila begins as white Tequila and no barrel aging is required. An unofficial term used to describe blanco tequila with extra aging or additives to smoothen its sharp taste. A distant relative of of the lily, Blue Agave (agave tequilana weber azul) plants are used to make tequila. A potbellied earthenware jug with a narrow and short neck made from mud. It was formed with leather of male goat. Seven botijas is equal to a barrel, a unit of measure for commercial use. Translated as "little horse", the Caballito, also called a tequillita, is the traditional shot glass for drinking tequila straight, or derecho. It is a 2 to 3 ounce glass, 3 to 4 inches tall with a flat bottom and usually a wider mouth. Also the name for a cocktail using white tequila, grenadine syrup, orange juice, orange or lemon blossom water and crushed ice, consumed in the Federal District (Mexico City). The first portion of the distilate, the cabeza (head), is the highest in alcohol and aldehydes, is usually discarded. Also, another name for the piña, the heart of the agave. See also Corazon and Cola. Drought resistant spiny plants with succulent stems like the saguaro, peyote and nopal (opuntia). No liquor is produced with any cactus plant. The nutritional breakdown in tequila. How many calories are in a shot of tequila? Another regulatory body responsible for tequila, officially founded on October 21, 1959, is the Cámara Regional de la Industria Tequila, or Regional Chamber of the Tequila Industry, an organization composed of industry members, and based in Guadalajara. Cultivated fields of agave plants, also called potreros, or pastures (and huertas, or groves, in the Los Altos region). A natural burnt color used sometimes for color consistency in the manufacture of Tequilas. There are two categories of tequila - 100% de Agave made with only the sugars of the Weber blue agave and Tequila, commonly called Mixted (Mixto) which is made using 51% agave sugars and 49% other sugars. See also Types of Tequila. Whip plant. An agave plant that doesnot look very vigorous, but appears old and tired. Rough liquor, firewater. National spirits (aguadrientes) made from sugar cane or mezcal in the 18th and 19th centuries. Considered to be of low quality. A sharp round edged tool used by the Jimador for harvesting agave plants. He uses this specialized tool to cut the leaves (pencas) off the agave leaving the heart or piña. A similar tool with a triangular point is used to clear grass and weeds. The last parts of the distillate to come through the still, usually recycled into a subsequent distillation. Shell. A bubble that remains on the surface of the tequila after serving, shaking or stirring it. See Perla. Condenser. The coiled, metal tubing that is used to cool and condense the steam produced by the distillation process.